Key characteristics of effective leaders. 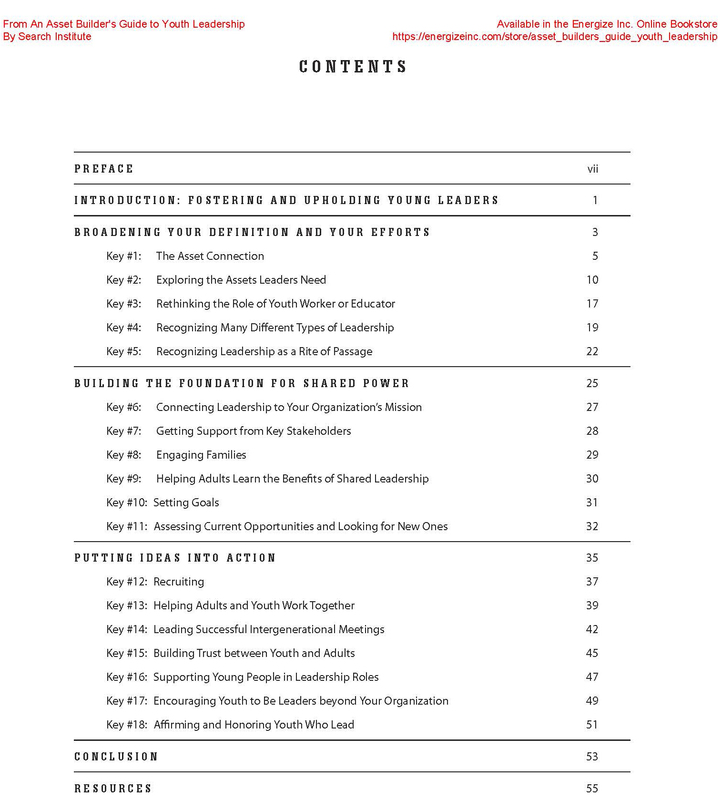 Expanding your idea of youth leadership. Helping adults and youth work together. Organizations that try to engage youth as leaders commonly lament, “Oh, we don’t have many young people who would be interested in that sort of thing”; or, “Young people today are already so busy, they don’t have the time to commit to something else.” These kinds of responses (or excuses) not only point out a narrow vision of leadership, they also highlight some of the challenges faced in recruiting youth to be leaders: many young people are very busy and not all youth are suited for all leadership positions. 1. Ask youth for their help. Often, people who volunteer were asked to participate. Instead of assuming that young people cannot or will not take on leadership roles, ask them. And don’t be afraid to ask more than once. Some young people may resist because they doubt their ability to lead. Others may simply be too busy, too distracted, or too unfamiliar with the job or role to respond the first time they are asked. 2. Avoid tokenism. Young people don’t want to be asked to participate just because adults need or want them to. Youth leaders must have real roles that are important and valuable to an organization. 3. Think outside the box. This approach applies to both leadership opportunities and opinions about who among your young people can lead and who cannot. Be expansive in your ideas about the leadership roles youth could take on in your organization. Similarly, look for ways to engage young people who aren’t usually leaders. 4. Match gifts and passions with needs and opportunities. Don’t just fill slots, find people who are really suited to the role that is needed. If there is a leadership role that doesn’t fit anyone, perhaps it is not well defined or is not truly needed in your organization right now. 5. Take every opportunity to affirm that young people are needed and capable. Many of the young people you work with may be getting messages at home, in the community, and elsewhere that they are not competent or able to be leaders. When young people are regularly put down, criticized, and devalued, they stop believing in themselves. You can’t change what happens in the rest of their lives, but you can be a consistent source of encouragement and high expectations. All young people have the potential to lead and make a contribution. Focusing on finding out what each young person has to offer and personalizing your recruitment efforts is a much more effective approach than launching a mass recruiting campaign or trying to find the “best” youth leader. Build relationships one by one. Take time to talk individually with young people about their gifts, interests, talents, skills, passions, and priorities. Often you’ll find (sometimes surprising) links between the leadership needs of the organization and the skills, abilities, and dreams of a young person. Recruit young people for leadership roles in which they can be successful. Match the tasks and responsibilities with their abilities and character. Give them opportunities to try out lower-risk, short-term leadership experiences that can help prepare them for more significant contributions in the future.